(NEW ALBANY, Ind. )—IU Southeast has long cultivated strong working relationships with employers, government and nonprofits in its service region of Kentuckiana. Now a new partnership between the Offices of Academic Affairs and Student Affairs, supported by a grant from the Indiana Campus Compact, will help the university systematize and grow those relationships, integrate them more intentionally in curricula and assess their contribution to student success in order to better prepare graduates for careers that benefit them and the communities in which they live. For the university, the project signifies a new, energetic effort to leverage its academic expertise for the good of the community. For the community, it means benefiting in tangible ways from close collaboration with the university while at the same time helping to make the institution more responsive to its needs. For students, it translates into more internship opportunities, more targeted career preparation, and more recognition for their own social consciousness and their desire to improve the region’s quality of life. The initial step in this effort was the formation of the Service Learning and Community Engagement Council, chaired by Dr. Gloria Murray, former dean of the School of Education. Launched in June, 2016, the Council is the first of its kind on campus. With a strong leadership team recruited from across campus administration, faculty, staff and students, it will eventually coordinate all service learning and community engagement activities, and become the go-to place for all matters relating to this core area of campus life. 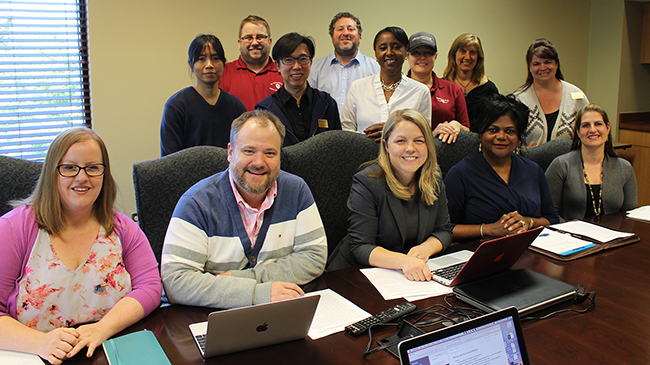 Members of the new Service Learning and Community Engagement Council will broaden and deepen links between IU Southeast and the region. (Seated, from left) Courtney Block, Jonathan Ruth, Danielle Leffler, June Huggins, Amanda Felton, (standing, from left) Faye Camahalan, Adam Maksl, Kok-Cheow Yeoh, Ron Severtis, Gloria Murray, Lisa Russell, Melissa Fry, Julia Mattingly. Not pictured: Jean Borger, Dakota Brooks (student), Rebecca Carlton, Uric Dufrene, Danielle Everage (student), Jason Meriwether, Robin Morgan, Tamara Voigt, Joe Wert. In so doing, it becomes the concrete expression of the new IU Southeast campus plan, Pursuit of Excellence 2016-2011, which embeds service learning and community engagement in the university’s mission. The plan calls for increased student participation in applied learning, a data collection and tracking system for service learning, scholarships and for community-based work, and other measures. To lay the groundwork for these and further initiatives, the Council’s first order of business is to conduct an exhaustive review of existing service learning and community engagement efforts on campus. IU Southeast has always played a big role in the community. This is reflected not only in the number of students and graduates who have interned, trained and worked in nursing, education and other areas rooted in everyday life, but in the work of AREC, the New Neighbors program, the community service requirement in the MBA program and partnerships with employers such as Norton Healthcare and nonprofits like the New Albany Housing Authority, to name just a few. Yet successes have not always been systematically tracked or recognized, making it hard to evaluate their impact. (In fact, only during 2004-2012 was there a broad effort to identify the scope of community engagement, as part of two campus strategic plans.) At the same time, it is difficult to know whether the university has served the community where that service was most needed. The Council’s database will allow IU Southeast to recognize and build on the work that has already been done, and to identify news areas for outreach. By convening a diverse group of members, the Council has the capacity to generate collaborative projects across disciplines that can appeal to a wider pool of potential partners in the region. Service learning itself, as a concept, lends itself to differing interpretations, ranging from volunteerism to vocational training. For Murray, defining the term is vital to establishing real goals and measuring achievement. Far from just donating time in an area related to coursework, service learning is a structured symbiosis. It can’t be an add-on to the campus plan. It has to be part of the school’s DNA. “We must be more agile in how we partner with the community to build partnerships that are sustainable and show real impact,” Murray said. The Council is poised to take on this challenge. Subcommittees with specific area responsibilities will gather information on and provide an overview of service learning and community engagement. Once these are identified, patterns can emerge, recommendations can be made for thoughtful resource allocation, units can learn about one another’s projects and collaborate, reducing duplication and magnifying the benefit for all players. And communication campaigns can be launched to inform the public of campus capacities and initiatives. Students will benefit from knowing there is an office on campus that can help connect them to faculty, staff and programs doing service learning, and by having someone whose job it is to build community partnerships, in order to increase the quantity and quality of opportunities available to them. The Council’s effort will be supported by a 2016-2020 Engaged Campus Grant from the Indiana Campus Compact, a consortium of 42 Indiana institutions of higher learning. The grant is designed to fund efforts to integrate service engagement into campus culture. At IU Southeast the grant will enable the Council to steer a wide range of activities for the next several years. These include meetings with community stakeholders, the establishment of learning communities, the launch of awards for community engagement, surveys, professional development for faculty, staff and students around best practices, salary adjustments for instructors engaged in service learning and other steps. These accomplishments will be promoted to the campus and community via a marketing and communications plan across various media platforms. At the center is the comprehensive review of service learning initiatives already underway. This document will form the basis of a self-assessment that will be used to apply for a Community Engagement classification from the Carnegie Foundation for the Advancement of Teaching, in 2019. This classification recognizes the efforts of institutions to strengthen the connection between higher education and the needs of society. A university with this classification has demonstrated that it is following through on its pledge to orient its mission and academic life to make a difference in their communities. It is a prestigious designation that is only enjoyed by 361 institutions nationwide. Indiana University (Bloomington) has achieved this classification, alongside IUPUI. With this goal in mind, and by using the documentation framework of the classification as a guide, the Council is in a good position to build an informational center on campus that will not only satisfy the Carnegie Foundation criteria, but serve as a true hub for community involvement across the region. “We believe that by bringing together expertise in academics, student life, assessment, teaching excellence, community engagement, mentoring internships, career development, marketing, data management, and other areas, and by working directly and collaboratively with leaders from our community, we will create something much greater than the sum of its parts,” said Dr. Jason Meriwether, vice chancellor for enrollment management and student affairs. For Murray, the project is mission-critical to IU Southeast. In five years, she envisions the Council having morphed into an office for service learning and community engagement, an assessment system that records and recognizes the efforts of all campus stakeholders in this area, and a generalized awareness that the university and community are working in partnership to address difficult issues affecting all citizens. “I believe our success as a university is tied to the success of this work,” Murray said. Homepage photo: Dr. Gloria Murray.